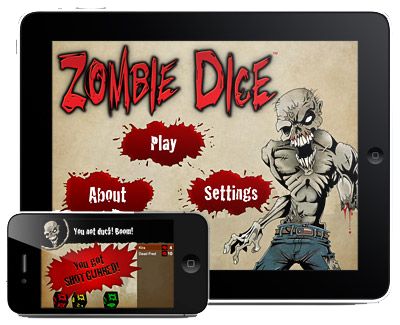 Zombie Dice has risen from its digital grave, with an update for iOS! One of our most-requested apps is back and ready to download on the latest iOS devices. Now you can eat brains on the go, or even by yourself! Of course, you can always avoid shotguns the classic way, with Zombie Dice from your local game store, as well. And look for Zombie Dice Horde Edition, which contains the base game, Zombie Dice 2, and Zombie Dice 3, as well as a brand new dice bag! With all these zombies around, just make sure you wear a helmet to protect that precious brain of yours.